DENMARK: A partnership of manufacturers, component suppliers, coating specialists and the Technical University of Denmark (DTU) are partnering on a new research project to combat leading edge erosion of turbine blades. Siemens Gamesa Renewable Energy (SGRE), Vestas, LM Wind Power, Hempel, and polymers firm Covestro Germany, have launched the Duraledge project with DTU. It aims to manufacture a series of different blade coatings to find a protection for the leading edge of blades. "The new protecting system is going to make the surface of the wind turbine blades more resistant to abrasion from the elements," said DTU senior scientist Leon Mishnaevsky. "In this way, the wind turbines are going to be more durable. Consequently, more energy will be produced and the maintenance will be cheaper." 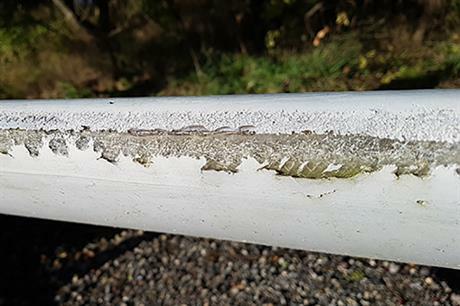 Leading edge erosion affects turbine production, while repairs and replacements are often costly and result in long periods of downtime. "The Duraledge project is interesting because we are aiming to identify the fundamental damage mechanisms that cause the erosion," said Vestas blade expert Kaj Morbech Halling. "If we succeed, it will be possible to identify a range of solutions resistant to erosion." To learn more about blade maintenance, check out Windpower Monthly’s Blade O&M Europe Forum (12-14 March 2019) in Amsterdam, the Netherlands.